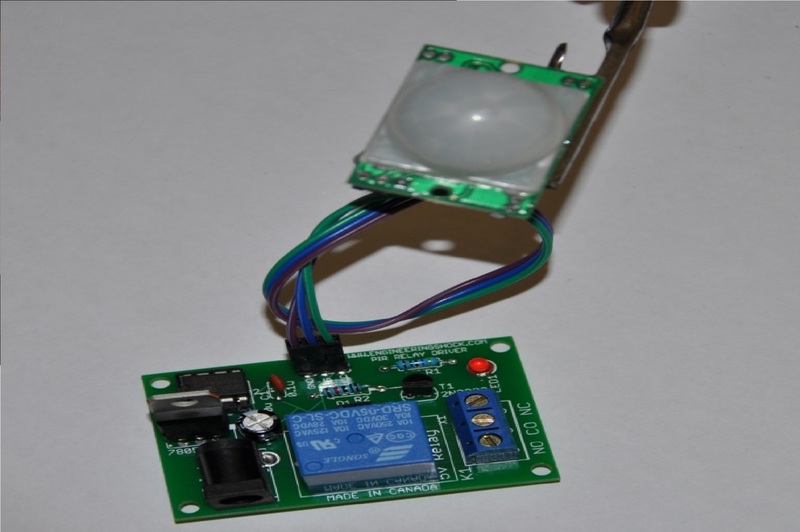 This listing is for a fully tested and assembled PIR based motion detector that can be used to turn on AC devices via an on board relay when motion is detected. PIR (Passive Infrared) sensors pick up on infrared signatures coming off of the human body. This set was designed for escape rooms, laser-tag arenas, paintball arenas, etc. The above video offers a full demonstration of how this device works. It comes with a fully tested control board, a PIR motion detector module, a three-wire harness that is used to interface between the control board and the PIR module, and lastly a 9v AC adapter so that you can plug your finished module safely into the wall. All you need to do is plug interface the PIR module to the control board with the wire harness and do a quick calibration of the PIR sensor. This is talked about in the below video, and you can skip directly to the calibration/harness instructions (9:20). The steps that you need to take are in the video BELOW. It is very easy to do. The reason why this module doesn't come with the PIR module already assembled is because it will risk damage in the shipping process. 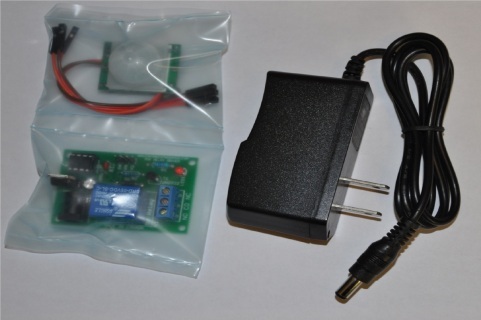 To operate, simply point the PIR module (After calibration) in the general area of interest, and plug in the included 9v 1A AC adapter. The control board will do the rest. There may be an initial false trigger when first powered on. After you leave the room, it would turn off with no issue, as long as the PIR module has been calibrated. The relay pins are connected to a 3-pin terminal block, and the pins are talked about below. There are four mounting holes so that you can easily mount it to a project box or wall. Please use the video above as a user manual. The shipping cost of $7.80 will get you air shipping (Small Packet Air) from Ontario Canada via Canada post).